watch=hodinky My name is ...=Jmenuji se ... desk=lavice under=pod red=červený Hi.=Ahoj. 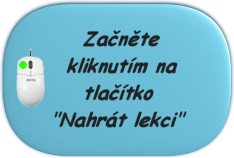 toothbrush=kartáček na zuby foot=chodidlo toothbrushes=kartáčky na zuby mouse=myš head=hlava thick=tlustý, silný board=tabule it's, it is=to je, je It means ...=To znamená ... mouth=ústa Sit down.=Sedni si. big=velký new=nový nose=nos Write.=Napiš. Where are you from?=Odkud jsi? eye=oko dog=pes Listen.=Poslouchej. Použití pojmu watch ve větách. Through his Russian made binoculars Vaslav Jelovsek watched the starting official raise his pistol. The Englishmen remained where they stood, watching the spectacle as it approached. Redman watched helplessly as the burning woman fell amongst the straw. Nobody was watching that night, it was too bitter for lovers. Blomkvist watched him with a patient, neutral gaze. He patiently watched the few people walking past. The little man was watching him quite passively. Mary looked at her watch it was six seventeen p. Ella watched the family going down the stairs. He could face anything at all watch and see. Tike watched as Mike opened the cargo door. He watched the digital clock counting down. He opened his eyes to watch her at work. He sensed that he was being watched. My wife has watched the rehearsals. Niedermann watched her every move. She had made him watch the video. Kaufman watched them, entranced. Eriksson watched him patiently. Bublanski watched him intently. Now she was watching him on TV. She watched him circumspectly. Then he consulted his watch. He simply wanted to watch. Redman amended his watch. She glanced at her watch. She looked at her watch. He looked at his watch. He checked his watch. He was watching TV.